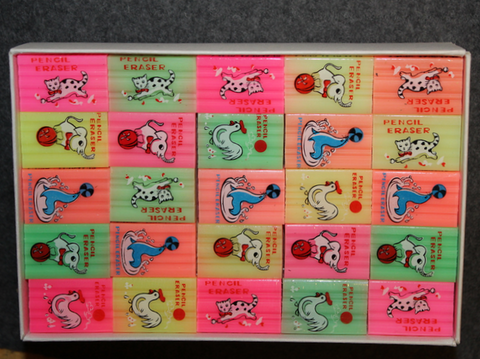 Original 1970´s Shanghai erasers for pencil. These are the type that had nice odor, and these were traded and swapped and some kids even ate them, but that is not recommended. Colors may have different hues, and there is 4 animal themes, a cat, an elephant, a seal and a rooster. It is not guaranteed to have any combination of color and theme if a single piece is ordered, and any possible light or dark color is possible. These were not very good as erasers, but the fragrant was the reason these were popular in elementary school in 1970´s and 80´s, atleast in Finland they were popular. We got these from an old office supple company. These are sold as single piece, but we do not have shipping method for 1pc, minimum order is 1,00€. If multiple pieces are ordered we will make an effort to include as much variation as possible.